As Earth dies, an architect is commissioned to remote build a monument on Mars from the remains of a failed colony; a man who has transferred his consciousness into a humanoid robot discovers he’s missing thirty percent of his memories, and tries to discover why; bored with life in the underground colony of an alien world, a few risk life inside one of the “whales” floating in the planet’s atmosphere; an apprentice librarian searching through centuries of SETI messages from alien civilizations makes an ominous discovery; a ship in crisis pulls a veteran multibot out from storage with an unusual assignment: pest control; the dead are given a second shot at life, in exchange for a five-year term in a zombie military program. For decades, science fiction has compelled us to imagine futures both inspiring and cautionary. Whether it’s a warning message from a survey ship, a harrowing journey to a new world, or the adventures of well-meaning AI, science fiction inspires the imagination and delivers a lens through which we can view ourselves and the world around us. 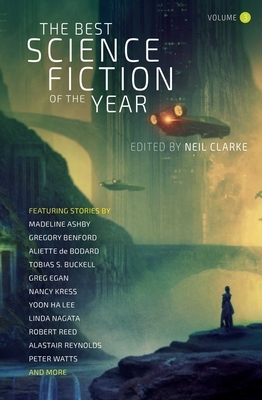 With The Best Science Fiction of the Year: Volume Three, award-winning editor Neil Clarke provides a year-in-review and twenty-seven of the best stories published by both new and established authors in 2017. Neil Clarke is the editor of Clarkesworld and Forever Magazine; owner of Wyrm Publishing; and a five-time Hugo Award Nominee for Best Editor (short form). He currently lives in New Jersey with his wife and two children.